Here is what I've been able to learn about him and about his wife, Fern Irene (Lyons) Hunt from various Internet sources. There is an obituary for him at the Kansas City Times, December 10, 1971. I would appreciate anyone who has access to this to send it to me. Herbert J. Hunt was born in 1895 in London. He became a Presbyterian minister, aquired the title "Dr" and immigrated to Canada, but we do not know the dates or sequence of these events. After establishing a Unity center in Toronto, in 1943 (age 47) he assumed the leadership of The Detroit Unity Association, which is now Detroit Unity Temple. Richard Billings recalls Herbert Hunt. Go here for the full interview. In 1949 he left to serve at the Unity Church of Truth in Spokane, Washington. In 1957 he and Fern founded the Unity church in Vancouver British Columbia. Two years later he became Dean of Bible Studies at Unity School until his transition in December 1971. Fern Irene (Lyons) Hunt died April 4, 2010 in Lee's Summit. She was born July 28, 1918 in Hingham, Mont. During World War II, Fern worked for Caterpillar, danced at the USO, attended Northwestern Business College and attended Unity Church of Truth in Spokane, Wash., where she taught Sunday school and adult classes. She and her husband, Dr. Herbert J. 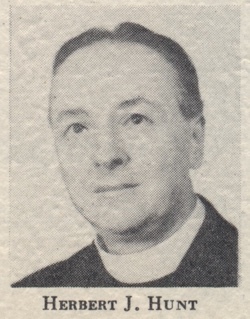 Hunt, founded Unity Church in Vancouver, British Columbia, Canada, before coming to Unity Village in 1957. 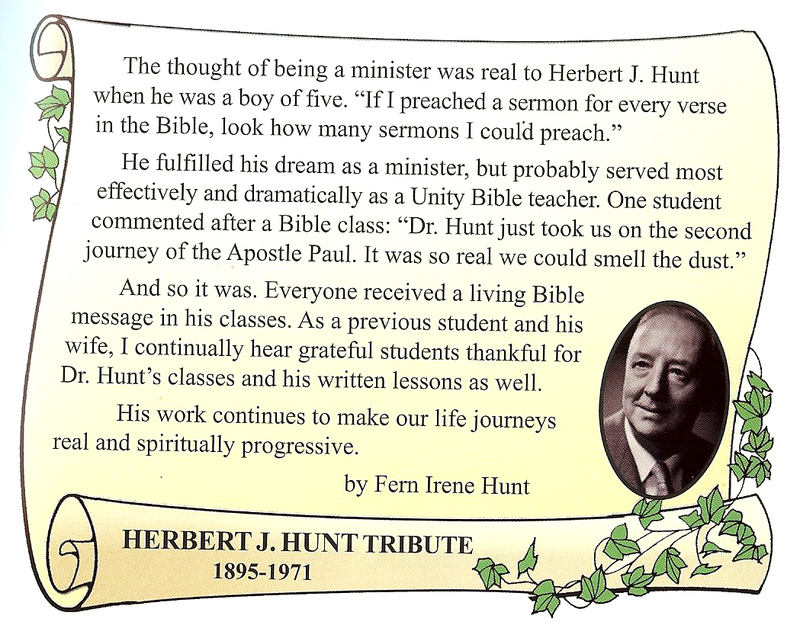 Dr. Hunt was a respected Dean of Bible Studies at Unity School of Christianity. Fern answered calls and letters for prayer with Unity's prayer ministry, Silent Unity, the publisher of Daily Word. Fern's suggestion led to the creation of the Peace Chapel at Unity Village as a quiet place of repose for visitors, students and Unity employees. In 1973, Fern established a Silent Unity ministry in the United Kingdom, which today serves all of Great Britain. After retiring, Fern volunteered in Unity Archives and cataloged the original letters of Unity co-founder, Myrtle Fillmore. Fern was the most genial, bright, positive person you could ever meet. She leaves behind two nephews and their families in Montana; step grandchildren and families in Canada; and a wide circle of friends, near and far. Her memorial service will be at 10 a.m., April 20, Fillmore Chapel, Unity Village. In lieu of flowers, direct memorial contributions may be made to two non-profits dear to Fern: Unity Temple on the Plaza and/or Silent Unity at Unity School of Christianity. 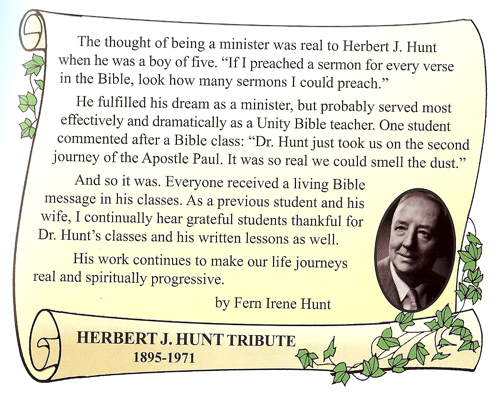 The thought of being a minister was real to Herbert J. Hunt when he was a boy of five. "If I preached a sermon for every verse in the Bible, look how many sermons I could preach." He fulfilled his dream as a minister, but probably served most effectively and dramatically as a Unity Bible teacher. One student commented after a Bible clas: "Dr. Hunt just took us on the second journey of the Apostle Paul. It was so real we could smell the dust." And so it was. Everyone received a living Bible message in his classes. As a previous student andhis wife, I continually hear greatful students thankful for Dr. Hunt's classes and his written lessons as well. His work continues to make our life journeys real and spiritually progressive.